As Michael is the Marketing guru in the partnership, he’s hosted a few catered parties where his wife provided free nail make-overs which later acted as mobile “billboards” for her business. Of course, the quality job that was done on the nails will be frequently noticed and inquired about, thereby offering an opportunity for word-of-mouth marketing and testimonial. Now, Michael the Marketing Guru, has seen the power of the dollar bill business cards from DollarCardMarketing.com, he is now able to get more bang for their buck! Congratulations, again, Michael! 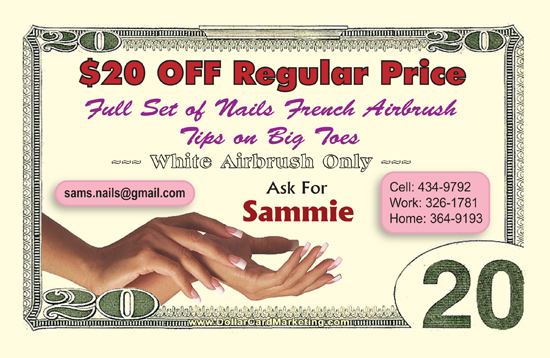 We hope these dollar cards bring lots of business to your wife and lots of visitors to her blog at www.Nails-by-Sam.com!! !